Mix everything and stir until the sugar is dissolved. Fry them in a pan, in the same way as pancakes. 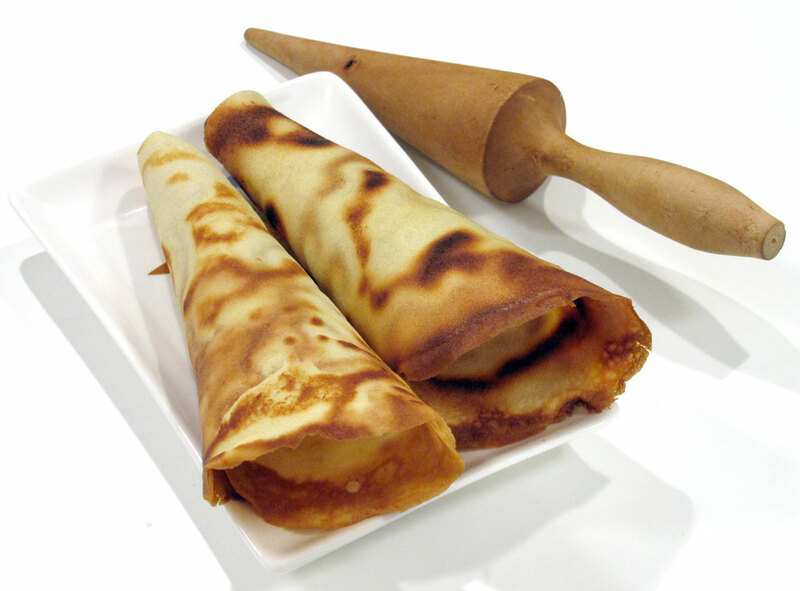 Fold them into cones while they are hot and let them cool. They should be cooked on a low-to medium-hot pan. There is a lot of sugar in the dough so it burns easily. But they should be fried for a relatively long time. They must be soft enough that they can be shaped, but as long as they are hot you will be able to fold them no matter what. So that is normally not a problem. You can even put them into a hot oven to make them more pliable if they firm up too quickly. But if there is any moisture left in them after baking, the cones will become soft and disfigured. It is difficult to know, how long they should have, before you try it the first time, so be prepared that your initial cones most likely will be ruined! The taste will still be fine though, so all is not lost. If they become soft then just fill them with ice and roll them around it. Like pancakes with ice. Ice Cream Cones are one of the few times where it's a good idea to use a non-stick pan. I fold them by means of a wooden cone intended for this purpose. Like the one on the picture. You can get them in plastic too. I have not tried to make these in the waffle iron, so no need to ask me whether it is better.